Sorry folks for the delay of my post for my final stage. I spent my blogging time soaking up the sun on the beach…it seemed the right thing to do. I left the bustling albergue yesterday well before 07:00 and set off with one of the bag rustling light shining ladies who now seemed perfectly acceptable after my night’s experience amongst many snoring, bed rattling, tossers (as in tossing and turning, but take it any way you want). And at this point I have to say how very much I enjoyed your interaction with my previous post. I burst out laughing at your comments so regularly that I am sure those around me thought I needed some medical attention. I was soon walking on my own and it was a fabulous stage. Beautiful tracks through moorland and woodland and delightful villages in bright but windy conditions. I took a couple of breaks in bars before glimpsing my first sight of the sea. Such a treat. 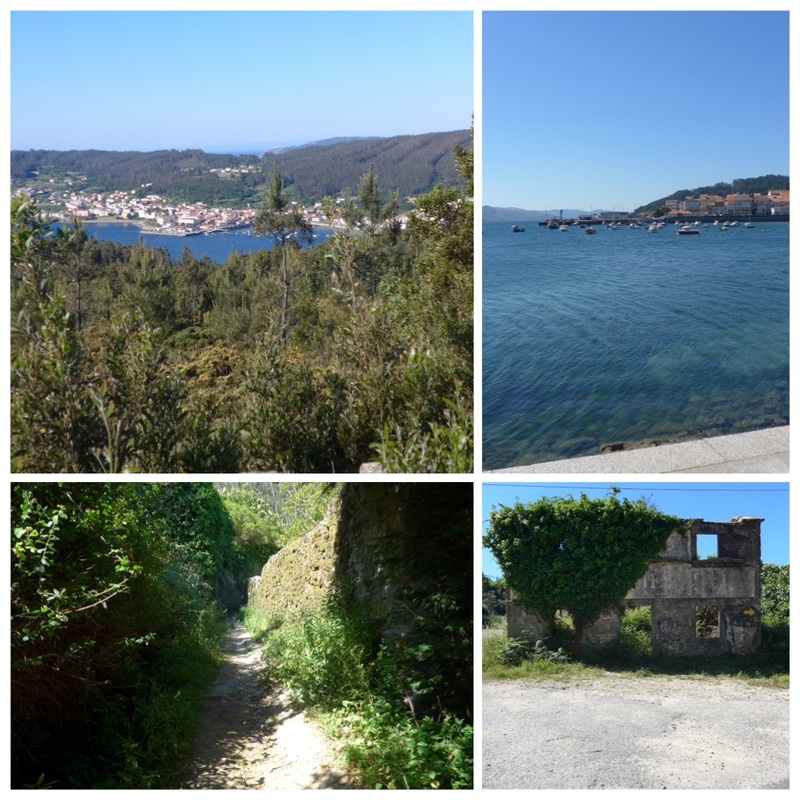 I passed through the large seaside town of Cee which looked very pretty in the older quarter and then took a very steep track which would eventually lead to the Finisterre peninsular. When I finally saw from a distance the long stretch of beach that I would walk along, a few tears of elation escaped from my eyes. The previous time I had walked into Finisterre it was from Muxia and a different route, not one that was particularly memorable. But I remember well my Dutch walking companion from that time telling me how he had felt on reaching the beach (thanks Peter) and I have wanted to take that path ever since. It didn’t disappoint. I removed my boots, took a quick selfie for prosperity and walked straight to the water’s edge. It felt marvellous – I have tears in my eyes now as I write this account. 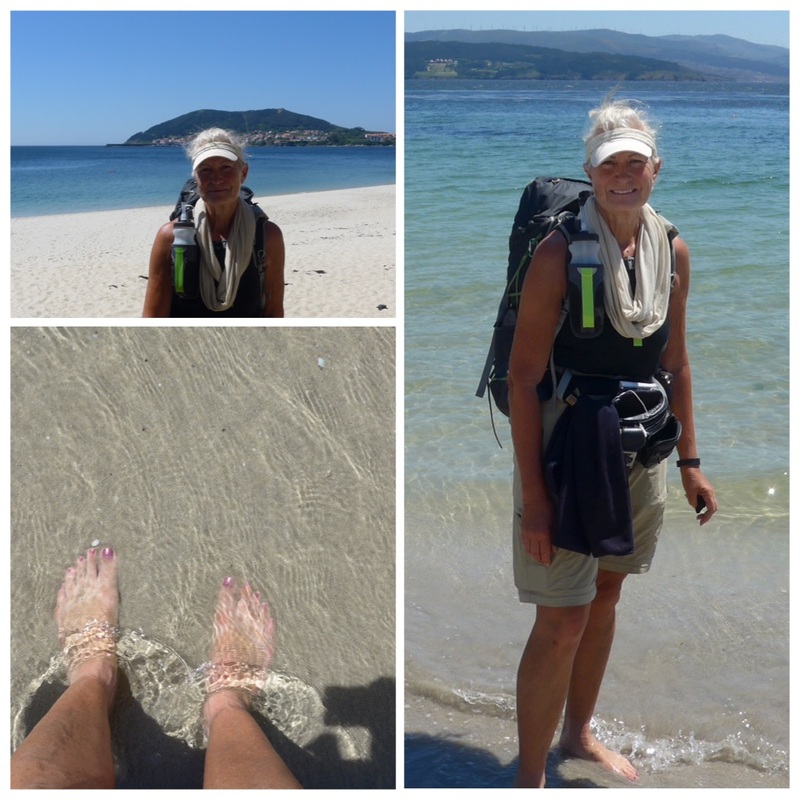 I sent a quick text to Olivier to tell him I had arrived and made my way along the 2 kms of beautiful white sand towards my destination of Finisterre. I don’t think many pilgrims walk along the sand, but take the easier path along the back of the beach. 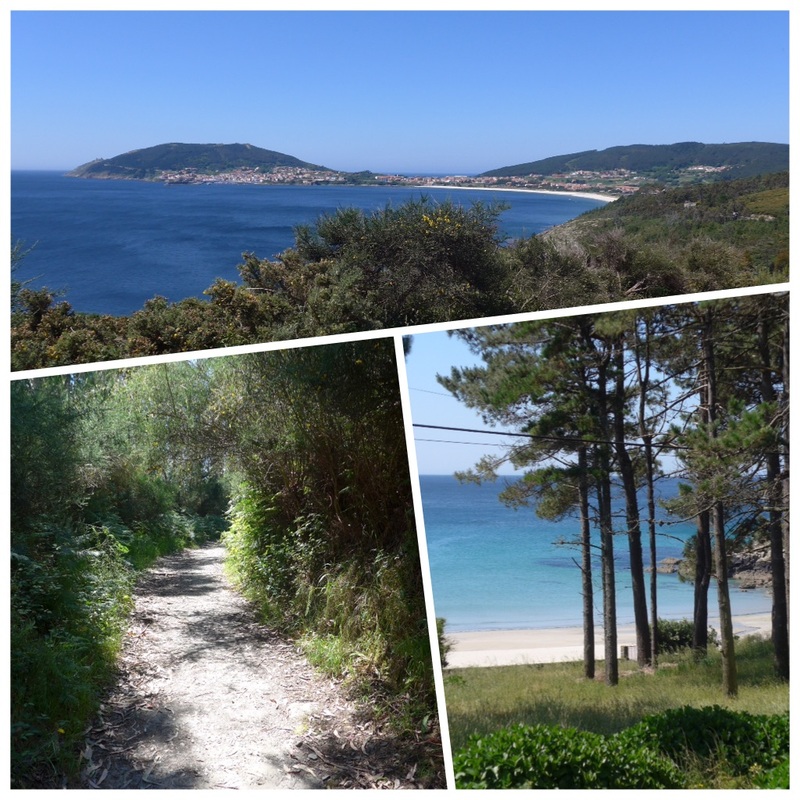 But I can recommend the experience – I loved every step of those two kilometres. And Olivier was there at the end to greet me. Perfect! 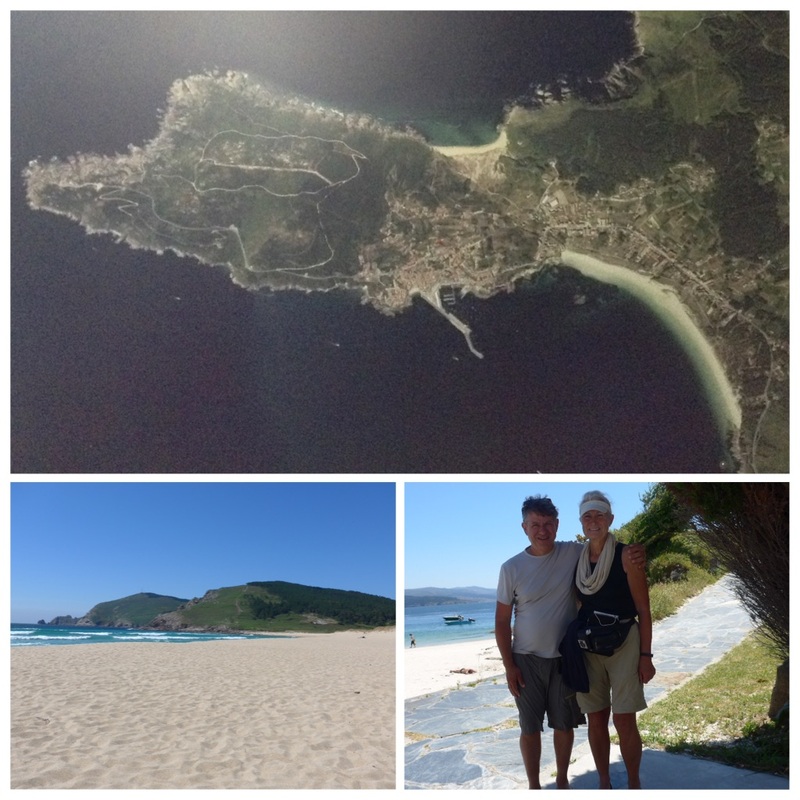 He had found a lovely albergue just outside the far end of the town (called Mar de Fora 10€, highly recommended) and after I had dumped my stuff we made our way to a beautiful bay of white sand to the north of the town. Not many people had found this slightly out of the way beach and we spent a couple of hours comparing our experiences over the last couple of weeks. 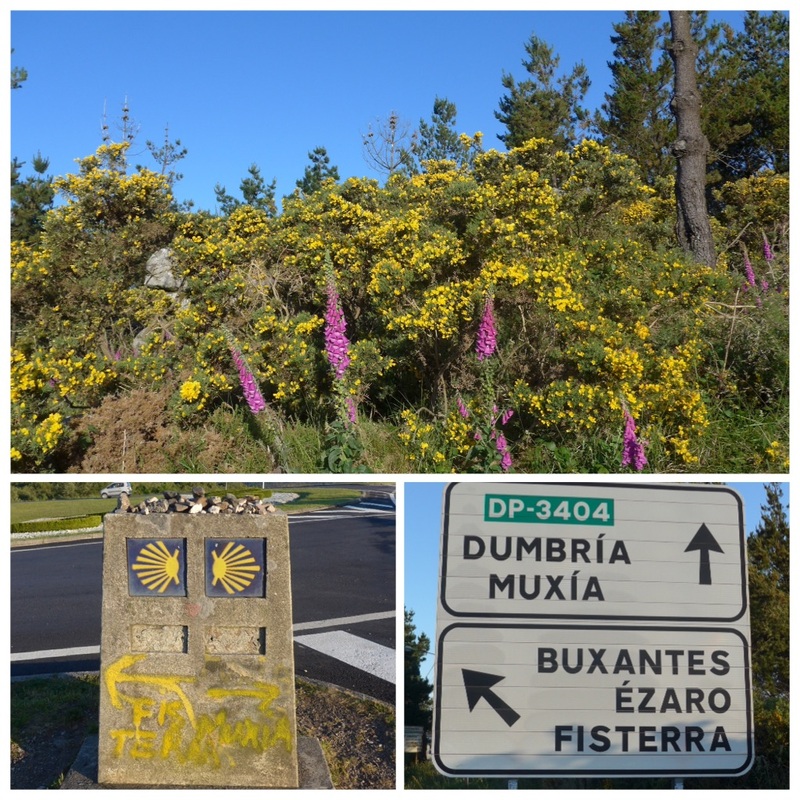 Later I went into the town to collect my Compostela for the Camino Fisterra before a fish supper and a hike to the lighthouse 3km uphill for the sunset. Poor Olivier was suffering a bit with his foot and couldn’t walk fast enough to reach the the top of the hill before the appointed hour of 22:06, and because I had stayed at his pace for too long before rushing on, I also missed the sunset. But it didn’t really matter – I already have the beautiful photos from my last visit and so I took a few snaps in the dwindling light and turned round to see how far Olivier had reached – and there he was slowly making his way to the top of the hill. So I turned back around again and I walked back up to the lighthouse with him. A perfect end to a fabulous day. What an achievement congratulations not only on completing your Camino but your commitment to all of your followers with your wonderful photography and the interesting and sometimes amusing posts it was a complete story told in daily instalments that included the good the bad and the ugly. A thousand thanks from me and I’m sure the many others who have followed your progress. Beautiful pictures to a perfect end well done. Enjoy the next few days relaxing you deserve it. Well done Maggie. A fantastic journey. You are Wonder Woman! Enhorabuena! I would like to add my appreciation to the many many wonderful tributes you will receive for your daily entertaining, truthful account and fantastic photos which shall be so missed. I wish you a good few day relaxation and a safe onward journey back to loved ones. Have a great summer, and from both us members of the MMC, we will miss you! Thank you for sharing your journey with all your pictures. Has been like being there! It looks wonderful there Maggie, fantastic achievement! Just how did you get the aerial shot?? See you soon but I too will miss my evening read. Welldone what an achievement, thank you for sharing your adventure i have looked forward to reading your blog every day. Bravo bravissimo Maggie, ditto to all congratulations. Every story has a full stop but the boot on its plinth is my touching memory of space and time massaging the end of another camino. Great achievement , wonderful blog. Will really miss reading about your exploits. Congratulations! A wonderful achievement! I have enjoyed everyday of your journey, a real inspiration. Have a safe trip home to family and friends. Thank you Jim for that meaningful quote. I shall use it in a future post if I may. Yippee yi yeah! You did it! Sending a BIG pat on the back to you via this message! Well done, Maggie. Your daily reports allowed me to be a part of your Camino. I feel as though I was with you. Thanks for taking me along. Perfect end to an amazing journey, well done! Crying for happy, and another wave of goose-bumps as I looked at another gallery of beautiful pictures documenting your journey. Thank you so much for the inspiration. I didn’t comment on your every post, but know, I was following with my whole heart and soul. Happy travels home. Buen ‘fin’ de Camino!! As everyone has said before me, you did an EXTRAORDINARY job on The Way. 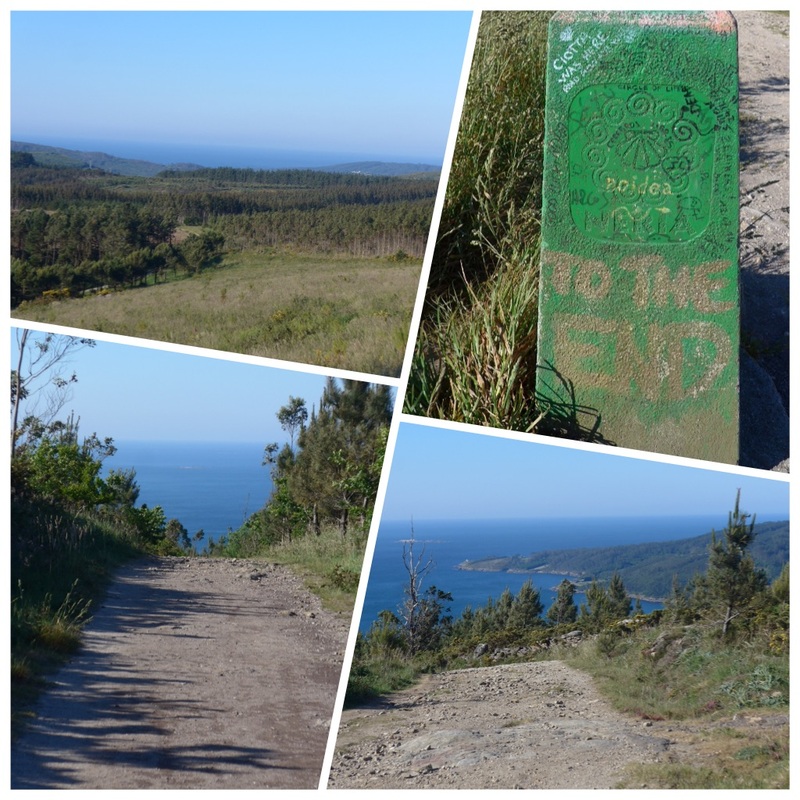 Now I know so much more about the camino…Many years ago I was going to walk it when Shirley Maclaines book came out. I was in a hard time in my marriage and felt like bolting. This was the walk I was going to do. So, 40 years later and still with the same terrific man, now I know I made the right choice but this walk was always on my list. Thanks again for all you have shared. I will so miss your blog. Happy homecoming. I love Spain and hope to return there next year. Have a good rest and CELEBRATE! You soooooo deserve it! Many congratulations Maggie, we fully endorse all previous sentiments expressed. Such an achievement and documented and photographed so expertly. Thank you for sharing with us, your exciting experiences and with such beautiful photos. I have been following your progress daily and will save your last blog for inspiration. Your narrative style reminded me of the many failed attempts to write lesser experiences. David is proud of you, I would like to share a lunch for three when I am back in Nerja in Dec. The wine is on me. Thank you Cheri. I am sure you will have an equally wonderful experience. Buen camino! Been following you from Canada and hoping to do the Camino Mozarabe also. I spend my winters near Nerja and so I could start right from Malaga as you did. 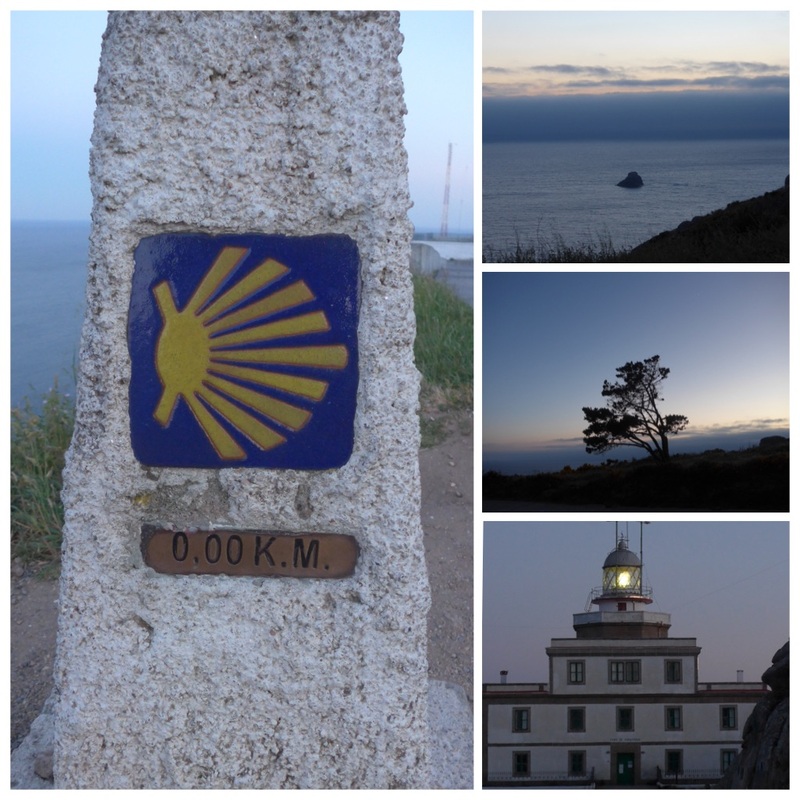 I have walked most of the Camino Frances and would love to see more of Espagne on foot! Gracias.